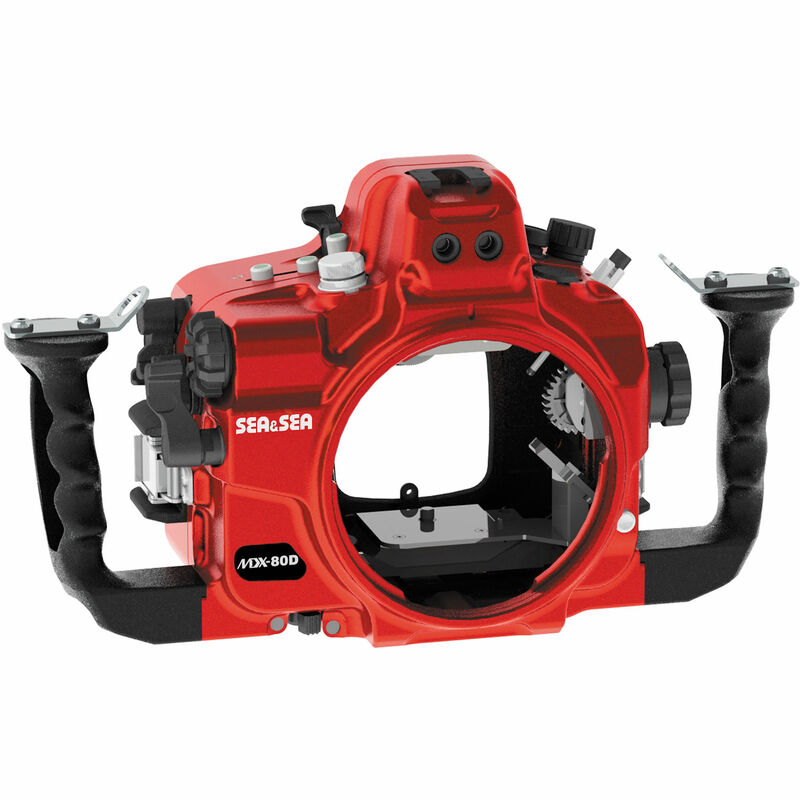 You can capture the beauty of sea life and environments at depths as great as 328', thanks to the Sea & Sea MDX-80D Underwater Housing for your Canon EOS 80D DSLR camera. This limited edition of the waterproof enclosure features an eye-catching red finish, and is otherwise the same as the original black housing. It is equipped with dual fiber-optic cable ports for attaching optional, external strobes to improve your lighting, and accepts an optional N-Type 2-pin sync cord connector for the same purpose. Ergonomic, mechanical controls, including levers, push-buttons, and dials, provide access to virtually all camera functions, while dual side grips offer better balance and handling and give you attachment points for lighting arms. Built for durability, the housing is constructed from precision-machined aluminum that has been anodized for resistance to corrosion. As a bonus, advancements in the machining method have allowed this housing to be made lighter in weight than previous enclosures. An optional leak sensor alerts you immediately in the unlikely event of a breach in the waterproof seal. The MDX-80D ships without a required lens port, and accepts a series of interchangeable ports for various lenses. For compatibility details, see the Port Chart. Additionally, the optional VF45 and VF180 viewfinders can be added on to enhance your view for better shot composition underwater. Does it accept the internal ttl converter ? Sorry, but it does not. You will have to move up to a different Canon Camera &amp; Housing.